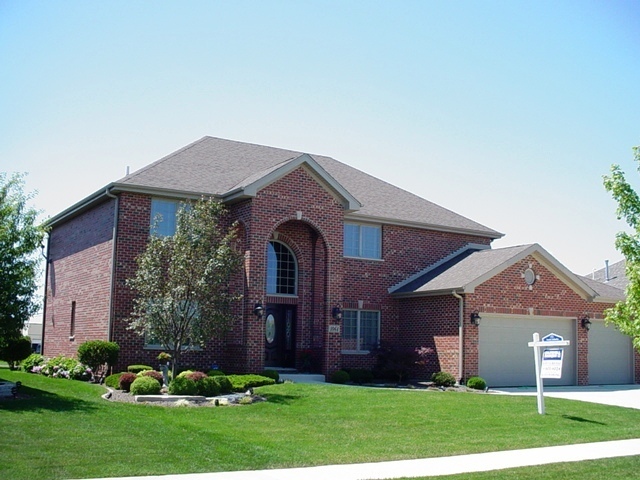 Super large ALL BRICK custom built 2 story home with 4 bedrooms, 3.5 bathrooms, with 2600 sq. ft. of living area plus a full finished basement. This quality home has a "Open Floor Plan" with a 2 story foyer, large great room with towering cathedral ceilings, 2 story limestone fireplace, open catwalk leading to the master suite with a huge walk-in closet, large glamour bath with Jacuzzi and double shower, 1st floor office with furniture, beautiful kitchen with granite counter tops, nice cabinets, all appliances stay, with patio doors that lead to a patio area which is great for your grilling area, first floor laundry leading to massive 3 car garage. Finished basement with bar area, theater area, pool table area, full bath, and many storage areas. When you walk through the door you are wowed with the beautiful open staircase and the towering ceilings. Exterior is professional landscaped, great concrete driveway, under ground irrigation. Home warranty is also included! !